Soybeans do indeed have some great things to brag about. They contain potentially healthful compounds called phytoestrogens. They are a good non-cholesterol protein source, are a natural source of lecithin, and are concentrated in essential fatty acids, including the beneficial omega-3s. Soybeans also are a difficult food for humans to digest. They contain more phytic acid than most grains or beans, which can affect mineral absorption. Some feel their natural enzyme inhibitors can block protein absorption. Kaayla T. Daniels, in her book The Whole Soy Story: The Dark Side of America’s Favorite Health Food, takes many more punches at the poor bean, citing allergies, sexual dysfunction, adverse affects on hormone development during puberty, thyroid deficiencies, and retarded growth in children as symptoms of eating too much soy. I agree with Daniels that there’s a real downside to feeding infants processed soy formula, which isn’t really comparable nutritionally to real mother’s milk. And soybean derivatives such as soy flour, textured soy protein, partially hydrogenated soybean oil, and soy protein isolate also certainly raise some concerns. These highly processed soy products — a result of multistage chemical processes — have become major ingredients in many prepackaged and fast foods. Products made from soy derivatives such as cheese, margarine, burgers, hot dogs, and bacon are a staple in most vegetarian and vegan diets. To me, these products do not seem any livelier or healthier than their animal-based counterparts. Less so, in most cases. The traditional Japanese diet, through centuries of trial and error, found ways to use soybeans in a healthful manner. The Japanese mainly ate carefully crafted, fermented soy products in small amounts. The fermentation process deactivates the phytic acid and renders the bean much more digestible. Tamari, shoyu, miso, and tempeh add flavor and digestibility to meals when served in small amounts. 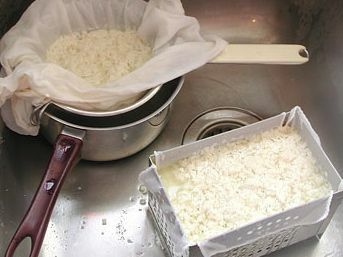 Though not fermented, tofu also doesn’t affect mineral absorption because of the way it’s made. Traditional tamari and shoyu are soy sauces derived from a long aging process. Some mass-market soy-sauce brands are not fermented and use hydrolyzed vegetable protein, corn syrup, caramel color, and MSG to mimic the color and flavor of natural fermentation. Cultures that traditionally used soy products in their diets also included sea vegetables. If there’s any worry about mineral absorption or thyroid deficiencies from eating soy, the plethora of minerals (including iodine) in sea vegetables counters it. So is soy a good bean or a bad bean? Where does eating soybeans fit into a well-balanced diet? Enjoying small amounts of fermented soy products and fresh tofu, in a diet that includes sea vegetables, is perfectly wonderful. Purchase organic soy foods, since an estimated 85 percent of the non-organic U.S. soy crop is genetically engineered. Buy things to eat that are fresh and lively, foods that you could reproduce at home without any heavy machinery. Don’t revere soy or shun it. Simply pay attention to quality and quantity. p(blue).Editor's note: Here's a Cookus Interruptus video of Cynthia frying tofu — and managing life's little interruptions.